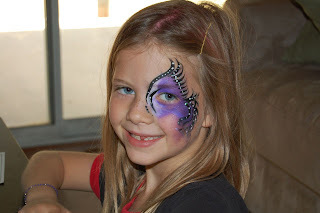 I spent the weekend with this little cutie K got her face painted at Woofstock, the Chandler dog walk. There were dogs all over the place and Hayden played, sniffed butts, and ate a lot of tricks. We then spent the rest of the weekend having fun and eating tasty waffles. Yep, pumpkin waffles. Tasty if you like pumpkin. With a hot chai latte!